Today's works-in-progress are very simple and straightforward. First of all, let me show you my turquoise jumper. The pattern I followed was the Incredible Custom-Fit Raglan pattern "recipe" by Pamela Costello. This wool was given to me as a gift and I love the colour! Unfortunately, I'm just a bit less impressed with my knitting. The fit of the jumper isn't great, and it's quite baggy under the armpits. Maybe I did too many raglan increases, I'm not sure. The problem is that this is my first jumper of this type so I had no experience to rely on, only the pattern recipe which I was following. 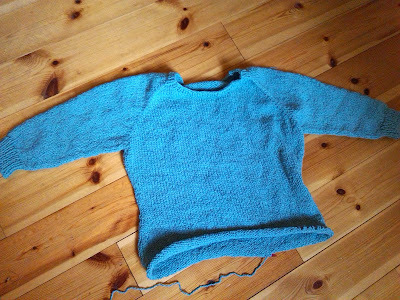 My next jumper attempt will almost definitely be a detailed, well-written pattern rather than a recipe-type one. My next project is a very portable pair of socks. I've been working on these during my 50-minute commute while reading Little Women on my Kindle. It's a beautiful book and I can't believe I'd never read it before, especially as it's a free book on the Kindle. 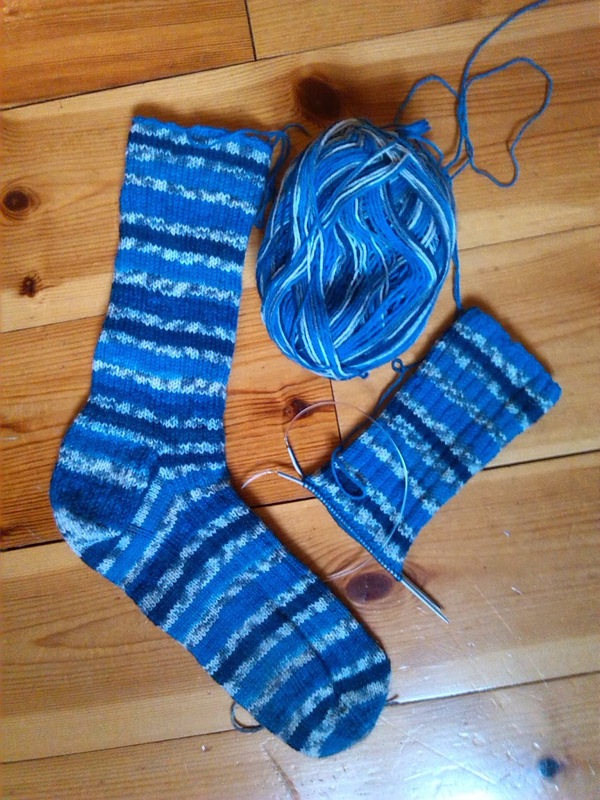 The socks are a 3x1 rib pattern, and are knit from some great-value sock wool from Lidl, which seems to be very good quality. The wool came in a pack with enough for two pairs, one self-striping and the other in a denim-blue solid. The self-striping is a gift and the blue will be for me. I might even invent my own sock pattern, we'll see. Both projects are almost finished, so maybe I'll have some things to show for Finished-Object Friday! This post has been shared on Tami's Amis. Go take a look for more WIP Wednesday posts! Thank you, I guess I'm drawn to blues at the moment! Very beautiful blues! I like how the patterning looks on your socks. Thank you! I like it too, and it was some of the cheapest sock wool I've ever bought! A shame about the fit of the sweater - I have the darndest time getting things like that to fit, so now I don't even try but go for store bought instead. Cute socks. I love self-patterning yarn for socks! I'm going to keep trying til I understand sizing a bit better. I still love the jumper! And yeah, I find self-striping makes socks fly by!